Looking for your next special needs family travel destination? Here’s an idea! Note: This is NOT a sponsored post. No compensation or any other form of payment has been provided. I recently had the opportunity to chat with Mike Sobbell, founder of Autism on the Seas and wanted to share this special needs family travel information. After our last vacation and our JetBlue autism awareness moment, I’ve been wondering whether we’ll ever be able to vacation again. Norrin’s made it very clear that he doesn’t want to fly. And I do not want to deal with another major public meltdown on a plane ever again. Once was enough, thank you very much. Without getting on a plane, our family travel opportunities are limited to road trips and train travel. But my sister-in-law has caught a serious case of cruise fever and she’s been trying to convince us to join her. I’ll be honest, I’m scared. I don’t know how to swim and I have a fear of just being out in open water. And if Norrin doesn’t like it – we’re stuck. It didn’t seem like much of an option. Last week I had the opportunity to chat with Mike Sobbell, founder of Autism on the Seas. I had heard about it but I really didn’t know what it was or how it worked. After learning about Autism on the Seas, I thought I’d share the info with you. What is Autism on the Seas? I thought Autism on the Seas (AotS) was its own cruise line. But it’s actually a special needs family travel agency that works with several autism-friendly cruise lines*: Royal Carribean, Carnival, Norwegian and Disney (YAY!). This means there are so many ports to choose from. 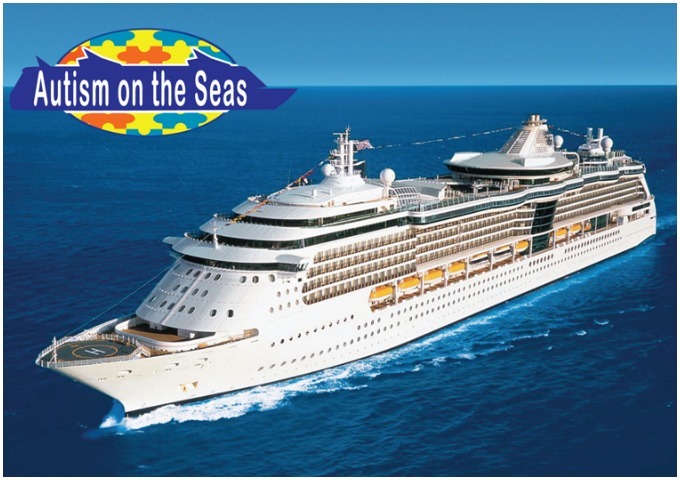 AotS organizes and staffs cruise and land resort vacations for families with special needs. They are dedicated to serving the vacation needs of families and individuals with autism, Asperger’s syndrome, and all cognitive, intellectual and developmental disabilities, as well as (but not limited to) cerebral palsy and Down’s syndrome. Autism on the Seas is First Special Needs Travel Provider to be Named a Partner of the Year by Royal Caribbean International.The “Autism Friendly Cruise Line” Program has been designed for cruise lines to ensure their pre-cruise and onboard services, venues and amenities are accessible for inclusion and participation by the autism and developmental disability community. * The “Autism Friendly Cruise Line” Program has been designed for cruise lines to ensure their pre-cruise and onboard services, venues and amenities are accessible for inclusion and participation by the autism and developmental disability community. What services does Autism on the Seas provide? Highly qualified AotS Staff cruises with guests to provide and coordinate all of the Activities, Respite and Services. Respite times throughout the cruise ranging from 1 to 2 hours at a time. Private sessions for our groups use, together with our staff’s assistance, at most of the ship’s exciting venues. Bilingual Staff for Spanish-speaking families. Cruises Without Staff – Pick the cruise of your choice on various cruise lines. Guests who book with AotS receives the Cruise Assistance Package at no cost. What I especially love is that they offer a Parent Connect Resource. As autism parents, it’s hard to try new things. We often look to other parents who have been there, done that. Being able to connect with a parent and ask questions about their experience is helpful and reassuring. And you don’t have to have a trip booked to make the request. Is it just for special needs families? Nope. While AotS is a special needs family travel agency, the cruises are open to all and anyone can book a cruise with AotS (making group travel easy to plan). However, Autism on the Seas cruises with staff can accommodate up to 40 families at a time. I think this video gives a great overview on what an AotS cruise with staff is like (and it’ll give you all the feels). Prices vary from cruise to cruise. However, AotS does honor cruise promotions, they offer payment plans and parents may apply for financial assistance. I haven’t started to book a vacation so I don’t know what it will cost our family of 3. If/when the time comes I’ll be sure to write a follow-up. Autism on the Seas is definitely a special needs family travel option for us. Even though I’m scared. I don’t want to limit our vacation options. I want to be able to do things as a family. So for the first time, I’m excited about the idea of planning (and saving for) a cruise vacation. Not only is it a chance to try something new but it’s a great way to connect with other special needs families and for Norrin to have some peer interaction while we’re on vacation. I’d love to hear your thoughts! Would Autism on the Seas be an option for your family – why or why not? For more info on Autism on the Seas visit: https://autismontheseas.com. This is great! I had no idea there was a vacation resource like this, I am bookmaking this for my friends with special needs kids. So great to know that this exists! Looking forward to hearing about your experience! Have cruised with AOTS twice and will never travel without them! What a terrific idea! I will definitely share this with friends. Two of my three kids are ADHD and have sensory issues, so I think this would be helpful for us also. I have cruised with AOTS before and getting ready to go again this summer, Love, Love, Love. so nice to go on a family vacation that everyone enjoys. I can’t even begin to tell you how wonderful the staff is and my boy is not the easiest to deal with. He loved every moment and the staff. Ate well and slept like a baby on the ship (normally not a good sleeper). And we are looking at planning #4. when we get back. Thanks for the update on Jet Blue, normally we drive to the port but I would like to go out of Florida for #4 and think we may Give Jet Blue a try. He has not been on a commercial flight before but does well in a small plane. We’ve also cruised with AotS, and agree with all the above comments about how great they are. Don’t be afraid to contact them with any questions you may have, and take advantage of their “Parent Connect” program, where you get to talk with other parents who have cruised with AotS. You will not believe how great a time you will have on one of their cruises. I have two sons with autism and we cruised with AOTS this past October. We had a great time. As a matter of fact that’s my son at the opening of the video with our group leader in Bermuda. It was so windy that day. The staff assisted activities are awesome, time was made specifically for our group to enjoy the activities on the boat and it took all the stress of what to do each day. Vacations for families of special needs kids are usually a lot of work for the adults but with the respite they provide in the evenings even my husband and I found time to enjoy the cruise. BTW – Nataly worked with my son Ryan a several year back and she was the one who told me about your site, been following ever since. Keep up the good fight.